Independent studio Mousechief has released a casual roleplaying game of charming proportions. 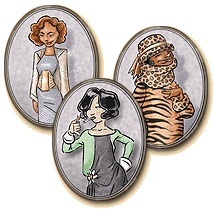 The game, Dangerous High School Girls in Trouble, puts you in the shoes of 1920s heroines inspired by the likes of Mae West, Marlena Dietrich, Myrna Loy, Barbara Stanwyck and Clara Bow as they roam the hallways of their local school. The combat in DHSGIT is verbal in nature, and the girls taunt, fib and flirt their way across the social landscape. Branching dialog, powerful prizes and stat leveling round out the game for a full RPG experience. Complete with stylized art presented in a world reminiscent of the board game Clue and actual music from the 1920's, Dangerous High School Girls in Trouble is sure to delight the RPG fan and casual gamer alike as they "help good girls get better by being bad." Dangerous High School Girls in Trouble has very accessible system requirements, and a demo is available for Mac and Windows on the Mousechief website.